Do Time-Outs Really Work With Toddlers? Giving your toddler a "time-out" for behaving badly seems easy enough. 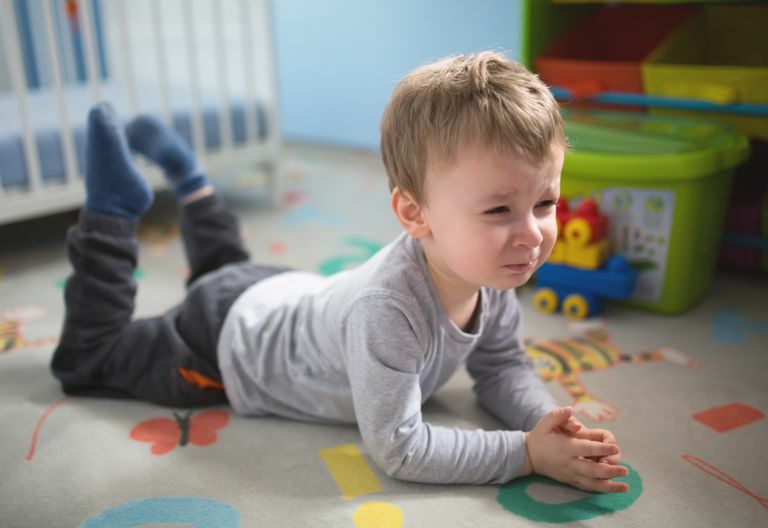 Remove your toddler from the situation where he is acting out, sit him in a chair or in another room, and tell him he is in "time-out" from the activity. Or, at least that's the theory. But do child discipline time-outs actually work? It often depends on who you ask and how you apply the discipline. Proponents of time-outs used for child discipline say that removing a misbehaving child from an activity and placing him in a pre-determined area or even a "time-out" or so-called "thinking" chair provides the toddler with a controlled way to calm down. Advocates say that properly behaving youngsters can continue their activity without further interruption from the misbehaving child, and a parent can use the end of the time-out to discuss with the tot what occurred, why it is not appropriate, and how the youngster should act in the future. Frequently discuss behavioral expectations with your child so that your toddler has a base understanding of right and wrong and consequences. Using a time-out without any prior discussions of what it means to a child may backfire on a parent. Positively remind your toddler of your expectations immediately prior to the activity. Use time-outs sparingly. Overuse of them for every single toddler infraction will greatly dilute their effectiveness. The amount of time for a time-out should be in keeping with a child's age. Most advocates recommend using one minute per year of the youngster. Having too long of a time-out can cause young children to actually forget while they were put in one in the first place. Remember that your intent is to separate them from the action--not make them scared or panicky--so choose your time-out location carefully. Have a talk with your toddler when time-out is over. Reassure your child that you love her no matter what, but at the same time remind her that certain behaviors cannot be allowed. Briefly talk about how a situation could have been better handled. Don't over-talk it either. Keep the conversation positive, loving, and to-the-point. Never threaten a "time-out" and then not carry it out. You are essentially making yourself an ineffective disciplinarian. Don't give multiple chances, and don't say "you're going to get a time-out" if you don't stop doing something, and then not follow through. If you say it, carry it through...even if the situation makes rendering a time-out awkward or even embarrassing. Parents around you will understand, and will probably be happy that you are removing your inappropriately-acting child from the situation. If your child lashes out, throws a full tantrum, or hits, bites or otherwise loses control when you are trying to administer a time-out, be prepared to leave (or at least go sit in the car, lobby or away from the action) altogether. At once. Please! Forget the embarrassment and get your child away from the situation--kicking and screaming if you have to--but don't ruin the event for everyone else. Further, don't let your child feel empowered that you will try and sweet-talk or bribe him into acting right. You may be mortified at having to leave the first time, but when you and your child have a clear understanding, you'll be the one left smiling when next time it is someone else's child misbehaving while yours acts like a sweet cherub. Opponents of time-outs tend to be pretty harsh in their criticism of this style of child discipline. Many naysayers the discipline tactic is overused and applied inconsistently and that the child often has absolutely no clue why he needs to be placed in time-out in the first place. After all, they say, many toddlers return to the same inappropriate behavior after completing their time-out. Is this a deliberate act of defiance? No, not at all. It's just that the child didn't apply his punishment to the behavior he was doing in the first place. If a toddler doesn't make the connection, then a parent may become increasingly frustrated and the child-parent interactions can potentially escalate. Further, the child didn't learn anything from the experience. Your child may be too young to understand the significance of a time-out. If he doesn't "get" why he is being punished or even why a time-out is such a big deal, then your disciplinary tactic isn't working. Your child resists time-outs. If you find yourself in a constant battle with your tot to try and "force" him to stay in time-out because he keeps getting up, this approach may not work for you or your child. Some parents try and one-up their tykes by continuing to add time to their time-out every time they get up or move around. This means you are sitting there keeping time and watching their every move. In the end, you are angry and upset and your child may likely turn the entire experience into a battle. Most parents don't apply time-outs consistently. More parents "threaten" a time-out than actually apply the discipline, effectively rendering it useless. After all, how many times have you heard a parent utter the words, "If you don't stop right now you're going to time-out! ", only to do nothing about a child's bad behavior when it continues? Threatening an action and not carrying through is the ultimate parenting no-no. Try simple and positive redirection. Time-out naysayers often say that simple redirection of a toddler's behavior works better than a punishment for young kids anyway. Whether you are pro or con about using time-outs as a form of child discipline, both sides agree on one key issue: If a child is acting inappropriately and causing potential harm to himself or others and ruining an event, parents should remove him from the activity or situation immediately without second chances. While the party may be over for that child on that day, there's no reason to ruin it for everyone else! And, there's always the next time for a tot to get it right!